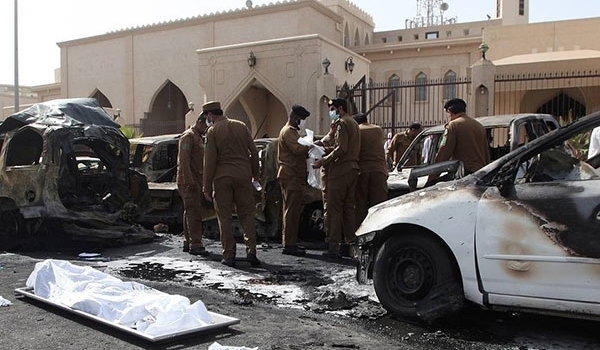 JNN 29 May 2015 Riyadh : Another Shia Sect Imam Hussein mosque in al-Damam, eastern Saudi Arabia, was targeted by a suspected suicide bomber during Friday prayers. Which resulted in 4 Casualties in the Parking area of the Mosque. This is a Second Suicide Bomb attack in a weeks time in the Land of the Harmain Sharifain , which shows the fragile Security situation of the Country . The Saudi interior ministry claimed that four people, including the bomber were killed in the attack on the Shia mosque on Friday, while five were injured. A Saudi social media report identified one of those killed in the blast as Abduljalil Juma. And the security personnel, who foiled the attack has been identified as Saeed al-Arbash. The blast took place at the parking lot near the Imam al-Hussein Mosque in the Saudi city of Dammam. A Reuters report stated that the security personnel became suspicious of a car parked near the mosque and as they approached the driver, the suicide bomber blew up the vehicle. It is possible that the suicide bomber may have been waiting for the Friday prayers to get over to carry out the attack. An image posted on social media showed Friday worshippers attending to a visibly injured man lying on the ground near the explosion site. The Reuters report citing an eyewitness identified as Ahmed noted that “a quick explosion” took place near the mosque. The eyewitness said a security personnel, who refused to let the suicide bomber inside the building, was killed in the blast. A widely shared image on Twitter shows the Saudi security personnel inspecting the blast site, with the remains of the alleged suicide bomber lying near the car’s wreckage. A video posted on Twitter claims that the blast took place minutes after the Imam of the mosque started delivering the Friday sermon. Commenting on the failed Dammam suicide attack, Ala’a Shehabi of Bahrainwatch.org noted on Twitter: “This could have been a massacre worse than last weeks terrorist attack had the bomber reached inside the mosque. This would be the second time in less than a week a Shia mosque has been targeted in the predominantly Sunni kingdom. The attack comes days after a suicide bomber attacked the Shia-Imam Ali Mosque in al-Qadeeh, a village located in Saudi Arabia’s eastern Qatif province, on 22 May. The Security Situation in Saudi Arabia is Detouriating at very fast speed , as the Sectarian Terrorists and Terrorism , which they have created about 35 Years ago , has now come to their home. And according to a Muslim Think Tank , it is now a Proven fact that the most Holy Land of Muslims , The Harmain Shariffain is under threat under the Ale Saud Rule , as long as the Saud Family is Running the affairs of the Country , the Level of threat will increase day by Day . The Same think Tank has suggested for a United Muslim Countries force , for the Protection of the Harmain Sharifain and the area around it should be under their Autonomous Rule, Govern by the Selected Group of Muslims from all the Sects and Countries around the World , Which should be declared as the Mustafvi State , on the pattern of Vatican City. This entry was posted in Middle East and tagged Dammam, Imam Hussein, Masjid e Imam Hussain, Saudi Arabia, Suicide Blast, suicide bomb attack, Suicide Bomber. Bookmark the permalink. WHILE PEOPLE ARE OFFERING PRAYERS IN THE MASJID , IT SHOULD BE MADE A DUTY OF A FEW YOUNG ARMED BOYS TO KEEP A VIGIL . ON MY OWN AUTHORITY , I BELIEVE THE BOYS WILL GET MORE SAWAB THAN ACTUAL PRAYERS AND THEY SHOULD SHOOT THE SUSPECT AT THE SLIGHTEST SUSPICION. ONLY IN THIS WAY TO KEEP REST OF THE UMMAH SAFE AND IS RELEVENT EVERYWHERE, SAUDIA, BAHRAIN, IRAN, IRAQ, SYRIA OR YEMEN .